Captain Semper was looking at the green-glowing screen in front of him. All the rivals of the Chapter have assembled – that much was certain. The question was, when the carnage would start. Semper was waiting for the right moment. - The moment is now 10thMaster! Semper jumped as the booming metallic voice of Interrogator Chaplain Javert filled the room. - Javert… I did not expect you. - No-one expects the Interrogator… But that’s not important right now. Give the signal to advance! - I do not take orders from you Javert! Stay at your station! And at that point, Javert produced the scroll with the Seal of the Inner Circle. Semper went through it and looked back at Javert. - It seems I’m left with little choice Interrogator Chaplain. The gauntleted hand of Captain Semper moved steadily towards the oversized red button in his control panel. Without second thought, he pressed it! - It is done. Inform the Grand Master accordingly Javert. Welcome to the sixth ETL! After a year of hiatus, the ETL is back, and it is back in a new environment not only of gaming but of the B&C too! Indeed, over the past year we’ve seen a new edition of 40k that changed the rules of the game in a significant way, advanced the background and produced an avalanche of new Codices (and official Indices as placeholders for the remaining ones) in what seems the speed of light compared to previous GW practices. In this new environment, new factions and sub-factions have appeared not to mention the presence of Primarchs for the first time in the 40k context. Interestingly, at the same time, the B&C took the brave decision to cater for all 40k factions transforming into a fully integrated 40k site. That means that Xenos now maintain dedicated forums and are an integral part of our community. I think it is easily understood that these major changes have a profound effect on the ETL, so much so, that taking a year off and wait for the dust to settle, was imperative. To make reading the rules, a less intimidating affair, I’m organising them in distinct posts, so frater can easily access them and refer to them throughout the event. E TENEBRAE LUX (ETL) is an open-for-all event that aims to motivate the frater to build-up their armies in solid blocks in an environment of friendly competition while cultivating frater interaction within individual forums as well as on a cross-forum level. ETL is designed to play down the inherent disadvantage of low traffic for some forums, setting a number of goals to keep everyone motivated and levelling out as much as possible the chance of victory for all. The challenge is to paint, to the best of your ability, game-legal units for your preferred army over a three-month period. The rewards come in two broad categories: personal and collective ones. On a personal level everyone who completes his/her vows will receive the “Custos Fidei”, the ETL badge of honour – a glorious distinction as veterans of previous ETLs can testify as well as other badges of individual achievement. On a collective level, there are a number of rewards with the most eminent one reserved for the Faction that cumulatively has the highest ETL score which will become “ETL Dominus” i.e. the ETL VI Champion! For the newcomers, brace yourselves for the juggernaut that is the ETL, and for the grizzled veterans: welcome back! DEADLINE FOR ENTERING: June 1st , 2018 @ 17:00 GMT. Participation is declared by submitting your first vow. All participants MUST make their first vow by June 1st (17:00 GMT) the latest. People that have not submitted a vow by June 1s cannot participate in this year’s ETL except as an out-of-competition entry. It goes without saying that the final deadline will be strictly observed, so make sure you get your final touches done on time, to avoid disappointment. Please note that GMT does not change from winter to summer time. Also note that deadlines will be strictly observed and the only clock that counts is the B&C clock! All 40k units pledged in the ETL must have updated 8thEdition data sheets. All Horus Heresy units pledged in the ETL must come from the FW official publications. Points discrepancies between Horus Heresy and 40k for similar (or outright the same) units is a hard fact of life and nothing can be done about it. See Captain Semper’s Notes for more elaboration. Participants must choose a single Forum and stay with it for the entire duration of the event and they can never change it. Once the decision is made, that’s it! All Forums are grouped into larger formations called the “Factions” based on theme, B&C structure and ETL traditions (not to be mistaken with the official 40k factions). IMPORTANT NOTE: READ THE RULES - EVEN THE VETERANS! Please read carefully as there are some important changes from previous ETLs – even seasoned ETL veterans are advised to have a thorough look to make sure they understand the changes. The Forums are the interface between real-life and the B&C internet community. B&C forums, that relate to the ETL, generally correspond to a Codex, although in some cases many armies are grouped together based on theme or discussion traffic as, in some cases, it may not justify an individual forum for them. We’re going to refer to those Forums as “multi-army” ones. Participants will have to choose a Forum and stick with it until the end of the event. Participants cannot change Forums during the event for any reason! All the points derived from their vows will be allocated to their chosen Forum – all of them. Each Forum has a dedicated ETL thread called the [Forum] Outpost. This is where vows for each Forum are placed, progress pics are posted, advice is offered and received and even some friendly banter and espionage may take place. In the Outpost threads there will be a detailed list of the Units that can be used by any particular Forum. Factions are groups of Forums put together based on theme, B&C structure and ETL tradition. These are the “Big Teams” of the ETL. The performance of each Faction will be recorded on a weekly basis in the Weekly Reports which will be linked to each Forum for quick reference. We have taken the view that Grey Knights and Deathwatch are more akin to Imperial Agencies rather the standard “against all-comers” Astartes Chapters given their narrow mandate and close links to the Inquisition. Furthermore it bides well the tradition of the ETL and the history of the B&C back in the day where the Inquisition forums were around. As such, and for the purposes of the ETL, Grey Knights and Deathwatch will be in the IFOR Faction (and boosting IFOR is never a bad thing). Details of what Units are available for each Forum can be found in the relevant Forum Outposts (links provided above). Participants who pledge for any IFOR Forum (called “Forum of Preference”) will also have the option to pledge units that correspond to any other IFOR Forum! However, the units from other IFOR Forums may never be more than the units stemming from the Forum of Preference. It goes without saying that participants may never change their Forum of Preference and all the points of all their vows will count towards the total of the Forum of Preference (i.e. will NOT split points between Forums on a per unit basis). Participant A chooses the Astra Militarum as his Forum of Preference and pledges a Leman Russ. He also wants to pledge a unit of Custodes and promptly adds a unit of Custodian Guard in his vow. Now he also wants to pledge a unit of Adeptus Mechanicus Sicarian Runestalkers. He may not do that unless he adds another unit from the Astra Militarum. So Participant A adds to his vow a Heavy Weapons Squad (from the Astra Militarum Codex) and then he’s free to add the Runsestalkers too. However, all the points of this and any subsequent vow will count towards the Astra Militarum Forum (and by extension to the IFOR Faction of course). “Agents of the Imperium” is a multi-army Forum. A multi-army Forum allows participants to choose Units from any army covered by said Forum freely with no allocated quotas. Participant B decides to pledge for the Agents of the Imperium Forum. She chooses to include in her vow an Inquisitor, a unit of Sisters of Silence and a Vidicare Assasin. That’s perfectly fine because although the Units come from different army lists they are all covered by the Imperial Agents Forum. Chaos Space Marines is a multi-army Forum. A multi-army list Forum allows participants to choose Units from any army covered by said Forum freely. Participant C decides to pledge for the Chaos Space Marine Forum. She chooses to include in her vow a Biologus Putifier and a unit of Khorne Berzerkers. That’s perfectly fine because although the units come from different army lists they all belong to the Chaos Space Marines Forum. Aeldari and Tyranids are multi-army Forums. A multi-army Forum allows participants to choose Units from any army covered by said Forum freely. Participant D decides to pledge for the Aeldari Forum. He chooses to include in his vow a unit of Howling Banshees and a Troupe of Harlequins. That’s perfectly fine because although the units come from different army lists they all belong to the Aeldari Forum. The same applies for Tyranids and Genestealer Cults. Participants for the AoD Faction are invited to choose sides and pledge for either Outpost AoD-L or Outpost AoD-T. All the points each participant earns will count towards their Outpost total no matter what they choose to paint (either thematically or choice of colours). Obviously, the points of both factions will be added together to work out the total score of the AoD Faction – so no harm done there. The only limitation is that participants of the AoD-L Outpost cannot choose units explicitly labelled “Traitor” and the participants of the AoD-T cannot choose units explicitly labelled “Loyalist”. Other than that, there is no other restriction. You can paint whatever Legion or other HH sub-faction you like in either Outpost provided you respect the condition above. It is a fact that the AoD Faction will suffer from a discount in points vs. 40k for similar units. This is not viewed as an overwhelming handicap in general, but we believe it is especially unfair for Titans. As such, for Titans and Titans only, the AoD faction will be using the 40k points, i.e. Participants must commit to paint 40k-legal Units from his/her Forum of choice by making official declarations known as “Vows”. Each participant must make at least one and up to a maximum of 5 vows. There is a cap of 20,000 points per participant – how you split those points between Vows is a personal choice. Vows cannot be altered once officially submitted, unless there are factual mistakes that need to be corrected. Models should be at most at undercoating stage (any single colour) at the time of vow submission. IMPORTANT NOTE: FAILING ONE IS FAILING ALL! If you fail to complete your second or any subsequent vow, all previous vows you may have completed are lost too and will count for nothing. All your vows will be nullified! In that case you will receive the Badge of the Oathbreaker, and you’ll contribute no points to your Forum and, therefore, your Faction. Additionally, you’ll be harming the Forum’s and Faction’s ETL scores by lowering the respective completion rates. So, think carefully before stepping-up your commitment. A Vow must be officially submitted in each Forum’s Outpost and will require at least two pictures: one “before”, upon vow submission, and one “after” to declare the vow complete. Participants are of course encouraged to post as many WIP pictures as they want in the Outpost threads, but the two (“before” and “after”) are the minimum. The “before” pictures should depict all the pledged units of the vow in an undercoated stage at most (whatever colour). Obviously, participants may use other, more colourful, format for their vows but always make sure that the items in brackets above are clearly mentioned. The point values are oftentimes revised either through official FAQs or through the yearly “CHAPTER APPROVED” publication or when a Codex substitutes an Index list. Make sure, when you value your units to use the latest points’ value and if in doubt feel free to ask in order to avoid unnecessary confusion. The ETL rewards both individual and collective performance. To this end, we present awards for both individual participants, Forums and entire Factions. Participants who successfully complete ALL their vows, will be eligible to wear ETL’s ultimate Badge of Honour the glorious Custos Fidei, irrespective of size or number of vows or their Forum’s or Faction’s overall performance. This, most prestigious badge, certifies that the participant delivered on his/her commitment and will also depict the total number of vows that he/she saw through. Wear it with pride! On the other hand, if a participant fails to complete a vow (even if he/she has completed one or more vows before the failed one), he/she shall receive the Badge of the Oathbreaker which will have to wear until the year-end in boundless shame! (or not, Interrogator Chaplain Javert has quite a following over the years…). Oathbreakers do not have access to any other kind of ETL award – individual or collective. Badge of [Forum] Champion: This badge is awarded to the participant with the most completed points within each Forum – so each Forum will have at least one champion, and in case of equal points, more than one. Badge of [Faction] Master: This badge is awarded to the participant with the most completed points within each Faction! Each Faction will have at least one Master, and in case of equal points, more than one. Badge of the Martyr: This badge goes to any participant who makes the maximum 20,000pts. If no one makes 20,000 points then it goes to the participant with the most points in the event. Badge of the Artificer: This badge goes to various entries that impressed the Inner Circle in terms of painting quality and modelling complexity. It is based on subjective criteria and can be claimed by out-of-competition entries as well. We plan to award at least 5 such badges and, in any case, no more than 10. Then there will be a poll (yes, a poll) for the entire community to decide their preferred Artificer to become the Master Artificer with the appropriate badge of course! There was a lot of internal debate as to whether we should abolish the Badge of the Artificer given its subjective nature – any decision will be open to dispute. But, we think that high quality painting should be recognised to balance out the awards for quantity. So, flawed as the process may be, we will still go through with it as described above. In order to determine winners on a collective level, we introduce the concept of the “ETL Score (SCR)”. Points completed: All the points of all the completed vows pledged for a Forum. If someone failed to complete a second or any subsequent vow, then any previously completed vows are nullified and will not be added to the total. Points pledged: All the points from all the vows pledged for a Forum. The total ETL score (SCR) of a Forum is the number of total points of the Forum, net of those who failed to complete a subsequent vow, multiplied by the CR. In this particular example Forum B will win over Forum A despite having fewer completed points on a nominal basis because it showed higher level of commitment thus getting ahead on a modified basis! And this is also how the SCR for each Faction is calculated, i.e. total points after penalties of all the participants of each Faction times the completion rate of the Faction – pretty straight forward! Will be awarded to the Forum that obtained the highest ETL score within their own Faction. All participants who contributed at least one completed vow to this Forum and failed none are eligible to wear it. 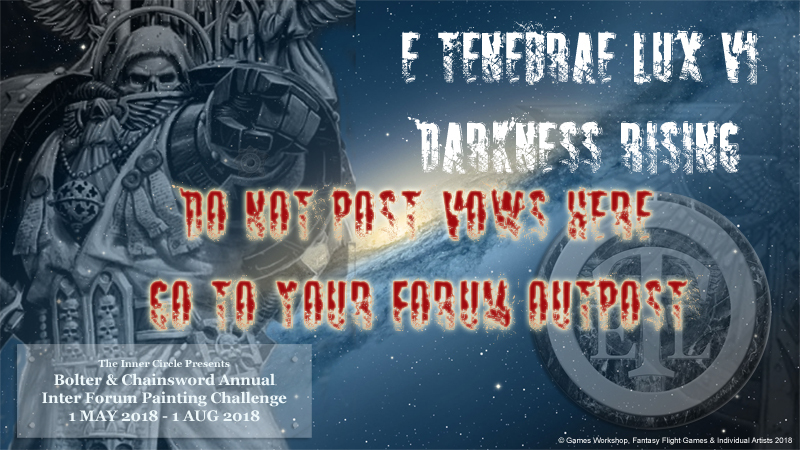 Will be awarded to the Forum that obtained the highest ETL score among all Forums in the ETL across all Factions. All participants who contributed at least one completed vow to this Forum and failed none are eligible to wear it. Will be awarded to the Faction that obtained the highest ETL score among the five Factions. All participants who contributed at least one completed vow to this Faction and failed none are eligible to wear it. Many Frater already display a number of badges that make for very large signatures. Before you add more, make sure you comply with the B&C signature rules. For optimizing the signature space, the Inner Circle will provide the awards in medallion form as well as in larger sizes. Feel free to contact me for any clarifications. Well, here we go again! Now the ETL is not only aligned with 40k’s 8thEdition but also takes into account the new structure of the B&C, embracing the new Xenos Forums and integrating them fully. 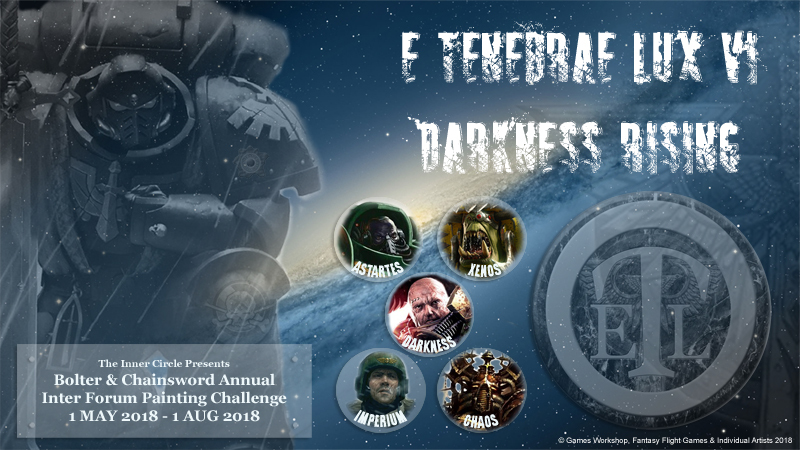 We aim the ETL to be truly a celebration of the hobby as it will take place through 20 Forums and 5 Factions – transforming the ETL to an event of unprecedented size and intricacy (go Tzeentch!). The first thing I would like to say is a HUGE “thank you” to The Shadow Guard, who despite his extremely tight schedule he took time out of his very important work to do once again the amazing imagery of the ETL! And not only that, he also provided sagely advice to all the finer points of this 6thETL – which were many and complex – in order to have a functional rule set. So, thank you Grand Master, this will not have happened without you! You may notice that now we have Forum and Faction level awards and competition. This was done in order to motivate everyone to give his/her best and not be disheartened by possibly a relative slow traffic in their Forums of choice. Fulfil your commitment and there will always be a target to beat and with reasonable chance to do so. So, this year we effectively have Forums competing against other Forums within the same Faction, Forums competing against other Forums across Factions and Factions competing against Factions! Good luck to all. Given the sheer size and increased complexity though, I have to say I rely on people to play in the spirit of the ETL more so than any previous time. The last thing we need is petty squabbles and unwarranted hostility. Also, feel free to point out to me any mistakes you may observe in order to sort them out as quickly and smoothly as possible. I fully understand that at times it may be confusing, so do not hesitate to ask me any questions, either publicly or privately – I respond to both; however, I prefer public questions so that other participants may also benefit from the answers. I would like to make a special mention to Xenos. This is the first time the Xenos appear in the ETL – I really want them to do well, even if (or especially if) they draw resources from the established Factions. With most of the Xenos having their 8thEdition Codices out, there is really no reason to hold back! I really hope that the B&C crowd will take this opportunity to paint their Xenos armies and embrace this new B&C segment. I would also like to make a brief comment on the IFOR. For years this section felt “penalised” as many players used a mix of IFOR troops on the table top (through the rules of allies in the past and now with the keywords), yet they could not do so in the ETL. Well now this ban is lifted! I hope that IFOR participants will grab this opportunity to enrich their vows with a the plentiful Imperial sub-factions including the Grey Knights and the Deathwatch – and let us not forget the brilliant new Custodes! I wish them the best of luck! Now some words about the AoD. I was in two minds as to whether to include it in this year’s ETL or exclude it on the grounds that AoD is still on the 7thEdition ruleset while 40k is now on the 8thEdition. More importantly, there are significant discrepancies between the points’ pricing of similar or even identical units. The Falchion Super Heavy tank for example costs for the AoD crowd around 505pts whereas, according the Forgeworld Index, the 40k relic version costs some 640 pts. That is a huge difference of 27% for the same effort and clashes with some very basic principles of the ETL. Even the lowly tactical Marine costs 10pts in the AoD context and 13pts in 40k – a 30% premium for the same effort. On those grounds I considered that excluding the AoD will streamline the event and free us of ambiguity and unnecessary inconsistency. I also thought that many AoD players could enter the event by pledging for the Space Marines or even Chaos and IFOR as there are 40k rules for many HH vehicles while 30k Space Marine infantry could very easily pass as 40k – without even stretching the “count-as” rule. And there would always be the “Loyalty and Treachery” – a 30k dedicated event that could become a HH version of the ETL (this may still happen btw). The Space Marines’ Faction (and to a lesser extent IFOR and Chaos) will be boosted artificially by the lack of an AoD Faction i.e. there would be entries by people that have no intention of using their minis for 40k - which kind of defeats the purpose of the ETL and puts Xenos in an unfair position. It creates real problems for the non-Marine elements of 30k such as Mechanicus and Solar Auxilia. Especially the former has a ton of units with no 40k equivalent. As such AoD is included as a Faction in its own right, despite the above concerns on point values and counting on mass participation and commitment to even it out. And, split in two, the Loyalists can shoot it out with the Traitors as well! As a final note on this matter, ETL VI will be a test. After the event we will re-evaluate our decision and see if the inclusion of AoD worked or we should exclude it in future ETLs, while investing heavily on a Horus Heresy (winter?) event to counter-balance the ETL. And at long last, I submit my own penance vow I made a couple of years before and I present you here my completed Cypher! Well, this is it from me, no more talk, now it’s time for the brushes! ETL wants to encourage creativity so conversions are generally accepted. One has to keep in mind though that the conversion should be easily recognizable as the unit it is supposed to represent. Remember WYSIWYG must be preserved. Following the above line of thinking and for the sake consistency, scratch-builds are not valid entries and are not allowed. Although some might be excellent representations of the GW originals others might be completely off and, with no intention of passing judgement on modelling ability or aesthetics, it’ll introduce an element of subjectivity that would be open to dispute. Such disputes we can do without and therefore we disallow scratch-build items altogether. See “Out-of-competition entries” later on. Special Characters are kind of a problem for ETL. They usually cost more than normal characters of similar stature due to their special rules or stats – both of which have no bearing in the ETL. However, such Characters exist in all Forums, so the effect is averaged out while the extra detail on the miniatures themselves ensures the effort to paint them is worth the premium. But what about Special Characters that do not have an official miniature out or what if participants want to make their own version of a Special Character that may already have an official miniature out? In that case we expect people to play in the spirit of the ETL and do the extra effort to present a miniature that will unmistakeably represent the Special Character in question. Kit-bash/convert the mini to the best of your ability not only with the correct loadout but with the extra attention that will make them stand out as true heroes of their faction. You also need to comply with the “irregularities” that certain Special Characters have. For example, a DIY Azrael is expected to have the Watcher – apart from a combi-plasma and a cool sword. If in doubt, feel free to raise the issue with me before you commit. There could be cases that what people want to build/paint cannot be reconciled with the ETL rules. It’s just one of those things. For example, some might want to do crazy conversions or scratch builds; others might want to paint miniatures for other B&C compatible gaming systems (BFG, Necromunda, etc.) or some might miss the deadline for joining in. It’s also a possibility that people might want to paint rival Factions’ miniatures. Sometimes participants set self-imposed tasks or issue challenges to either other frater or other Forums or entire other Factions. These challenges usually take the form of a self-inflicted penalty on the challenger if a condition set in the challenge is not met. For example, it may be something along the lines “if my Forum delivers fewer points than Forum X, I’ll paint a special character from X army list”. This special kind of vow is called “Penance Vow”. These vows, although welcome, are totally unofficial and they have no bearing on the mechanics of the ETL. Furthermore, failing to uphold them has no impact whatsoever (i.e. I’m not going to record nor police them). It is left up to the participants to uphold it. These are the FAQs based on previous years’ experiences and of what else I could think of at this point. However, it is possible (inevitable?) that new issues may arise that would require a ruling. In that case, once I make a ruling I’ll add it here so all participants can be updated simultaneously. So, before you ask a question check here first – it might be already answered. Well, there are many ways to do that: If you have already uploaded it in an image-hosting site, you can copy the image address and then paste it straight to your post using the “image” tool at the menu of your post editor. Step 1: go to Gallery. The link to the Gallery can be found in the top menu of B&C home screen. Step 4: Name your Album (e.g. ETL VI) and if you want you may add a description (e.g. miniatures painted for the 2018 ETL event). You may then assign it to a specific category to reflect the theme of the content or just leave it at the default “The Bolter & Chainsword”. You can further customise this by allowing/disallowing comments and/or ratings. A: Yes, they can be entered as standalone entries for the points mentioned in the relevant section of the Codex or other lists. Q: What about mixing units from different Forums within the same vow assuming they share the same Faction? A: As a general rule you cannot. What defines the units you can pledge in a vow is the Forum. Sometimes Forums allow for more than one Codex or army list and sometimes it only allows a single Codex. Be that as it may, you should visit your Outpost thread to see what units can be used with each Forum. A: No. You must pledge a particular configuration – so choose carefully. There is no benefit from magnetizing, not gluing or blue-tacking alternative bits on the mini. If you intend to do alternative load-outs, you may as well pledge the most expensive configuration (in terms of points) so you’ll get the maximum benefit. Q: Can my second vow include expansions of units completed in my first vow? For example if I vowed and completed a 5-strong tactical squad can I then vow for another 3 to bring it to a total of 8? A: No. Each entry should be a standalone 40k-legal unit from the list of your choice. No add-ons on previous vows. A: We believe 5 vows to be adequate to capture the zeal and to deliver the points that the participants plan to complete. Also (and this is important) the limit of 5 vows creates an additional strategic consideration. Participants need to think ahead, discuss with each other, review their stash of miniatures and decide on their commitment when the time comes. I think this adds another dimension to the ETL! Q: Why a limit of 20,000pts per participant? Past experience has shown that the average vow of the ETL is ca. 600 - 700pts. However, there were cases where the points’ value of a vow diverges significantly from the average and we had cases where people were vowing in excess of 5k pts per vow and in some cases more than 10k pts(!) with the record being more than 17k pts in a single vow!!! Now this was the 7thEdition point system, which generally allocated lower points for the same units than 8th. Although the ETL cannot be won by any frater singlehandedly, the painting daemons amongst us can influence the performance of a given Faction disproportionally. As such the Inner Circle decrees that there will be a limit imposed on each individual participant of 20,000 points in total for all 5 vows! We believe 20,000pts per participant to be more than adequate to sate the thirst of the painting daemons among us in this new 8thEdition environment while retaining the focus of the ETL on mass participation and teamwork. We also want to encourage people to focus on quality rather than quantity, as improved standard is always preferable to painting huge amounts with no tangible impact on painting quality. Q: Why was the limit changed from 3,000 pts per vow to a total of 20,000 points for all 5 vows? I considered many alternatives, but this strikes the best balance of keeping it same while allowing people to paint those behemoths. Now if someone wants to paint 3 Warlords or 4 Reavers, then I’m afraid he/she will be limited to the cap of 20,000 points. The second reason for raising the total from 15,000 pts to 20,000 pts is that the point-system in 8th is something of 30%+ higher than the equivalent points in 7th Edition. As such a points hike seemed appropriate in ETL VI. However, if we are talking about models of tank of even Knight / Titan size, then a more case-by-case approach will be required to take into account the relative complexity of the models and the effort involved in completing one. For example, if the model in question is of significantly lesser complexity vs. the GW/FW equivalent (even if it’s roughly the same overall size) you should expect a (sometimes severe) haircut in the points’ value. The idea is to keep this as fair as possible and if someone is making the effort to paint up a hugely complex model he should be awarded the full points – whereas someone who opts to go with a less complex “count-as” then he/she should be prepared to give-up some points. Q: Why introducing the completion rate to determine the ETL score? A number of reasons played into taking this decision. Firstly, I wanted to give an extra boost to the Forums/Factions that have lower traffic but display a great enthusiasm for the ETL yet are unable to threaten the top positions. Well now they will have an extra incentive. Staying true to the cause and deliver high completion rates will have a tangible result (as well as the implied honour of delivering on the promise). Secondly it means that participants will be incentivised to pledge more manageable vows to begin with and those who overextend themselves will feel the added pressure to deliver as, in case of failure, they will not only be depriving their Faction of their pledged points for this and any previous vows they might have completed; they would also be penalising the chances to win by lowering their Forum’s/Faction’s overall completion rate. So you feel like vowing a huge amount? You’d better be confident you’d deliver! Q: What happens when an existing army list gets updated? If an updated army list comes out during the life of the event that invalidates a pre-existing one (e.g. a Codex that invalidates an Index list) then all units that have already been vowed (either completed or in WIP stage) will still be priced according to the value points and configurations of the pre-existing list. Once a vow is made it cannot be changed (provided it’s factually correct at the time of submission). Units included in vows made after the release of the updated list must be configured and priced according to the updated list with no option of going back to the pre-existing list. Q: What happens when a totally new army list is released? If B&C decides to allocate the totally new army its own Forum and this happens before the cut-off date of the event (June 1st) then participants who have not pledged for any Forum yet can choose to pledge for the new Forum. If the totally new army comes out after the cut-off date of the event (June 1st) then it is irrelevant for this year’s ETL – it’s just too late. Participants that have already vowed for a Forum cannot change sides. Let’s assume that GW releases Codex: Kroot before June 1st. If the B&C decides to give Codex Kroot its own Forum, then participants who have not pledged for any Forum yet can now choose to pledge for Kroot. If however B&C decides to integrate Codex Kroot in the Tau Forum, then only participants pledging for the Tau Forum may use it, and they may do so even if the army is released after the ETL cut-off date of June 1st. Q: Have you put all the Astartes in one faction? Have you lost your mind? I know many of you may be taken aback by the grouping together of all Astartes Chapters. Well, don’t panic. It is true that the Astartes do vow big – but they also hold one of the lowest completion rates historically. If we were to apply the same rules last year, the Astartes would have won with a fairly slim margin – nothing that cannot be altered in my view. …makes me believe that this is fair. If it turns out it is not I will be revisiting the concept next year. Here are some thoughts that will describe the spirit of the ETL – these are some high-level principles, which cannot directly translate into rules, and therefore I will not be policing them per se. It is left to the individual participant to abide by those principles and try to get the most out of the ETL experience! The list below is not exhaustive – just indicative and hopefully it will convey the feel and purpose of the ETL. An important thing to remember is that the ETL is an opportunity to develop your skills, asking and giving advice and generally improve your painting regardless of your skill level. What I mean is DO NOT COMPROMISE your skill – it’s better to do a smaller vow painted to the best of your ability than double the points with a sub-par job (according always to your own personal standards of which you are the only judge). A good example of that is basing. The fact that doing bases is not compulsory in the ETL is for the benefit of those who do not yet possess the skill of doing proper basing and I don’t want them to feel excluded – not in the least! If, however you do possess the skill and you will not consider the model complete unless you base it then it is expected that you do base it. I want people to look at their minis and proudly say: “look, I did this during the ETL” instead of “look what that stupid ETL made me do”… We always encourage quality over quantity if it comes down to that choice. “Count-as”: do not abuse it! Although all entries are supposed to be as WYSIWYG as possible, the purpose of the ETL is also to encourage creativity and imagination. As such it is possible to see some unorthodox painting/modelling like Chaos assault troops “counting-as” Blood Angels’ Death Company (because that particular Successor Chapter is on the verge of falling to Chaos) or loyalist-looking Chaos Marines since that particular army may represent a recently fallen Chapter – not yet mutated or warped. All these are totally welcome and well in the spirit of the event, provided participants go into the trouble to convey the message correctly. Painting green Blood Angels Successors is fine, painting Dark Angels and naming them Blood Angels is not. Also, if people are using the “count-as” rule to just paint totally unsuitable models (using Space Marines to represent Flamers of Tzeentch for example or normal Space Marines “counting-as” Primaris) it works totally against the spirit of the ETL. Sometimes it’s a blurred line and one that’s easy to cross so it is left to the fraters’ self-restraint to do the right thing. Remember, you can always do what you want as an out-of-competition entry. As a last point, you need to keep in mind not to exploit the “count-as” rule to benefit you in points. It’s OK to say this plasma gun “counts-as” melta gun, but it is not OK to say it’s a lascannon. Another element is how to price your units. Some points’ optimization is to be expected (especially by those who, like me, paint for the sake of it and don’t think much about table-top efficiency) but please avoid overdoing it. For example, painting a Space Wolves’ Wolf Guard terminator squad and claim there are five Wolf Guard Battle Leaders in Terminator armour just to reap extra easy points is just not cool (thankfully this has never happened with the SWs – it’s just an example). But if on the other hand you really want to paint five Battle Leaders then of course it is cool. Just paint what you intended to paint anyway. And, as mentioned above, you should not abuse the “count-as” in order to gain a points’ advantage. Another point (that is actually part of the official rules) is that it is expected that you start work on your entries AFTER you submitted your vows and not before. Models can be assembled and primed but that’s it. If someone was not aware that the ETL was coming and he/she has applied a base colour on a few minis in a squad I’ll probably let it slide but generally speaking nothing should be entered if it is worked on above primer level. I have limited ability to police this (I do have some) but it is expected, and I’m stating the obvious here, that people will not cheat. If you’ve started work on something before the ETL then it is not a legitimate entry (unless it is presented as out-of-competition). Lastly the ETL is an opportunity to paint your army while having fun interacting with other frater within our community. There is an element of friendly competition – which is intended and welcome, and friendly banters are not only tolerated, they are expected. Having said that, this is still intended as light-hearted fun. Please keep that in mind in your exchanges and also that there may be a language barrier or people can be at a different wavelength. Make sure you use appropriate tone and don’t forget the smileys – they go a long way to give context. And remember: B&C and The Forge rules ALWAYS apply. Hope the above give the frater an idea of what the ETL stands for and hopefully those who choose to participate will endorse the spirit as well as follow the rules. In this thread you can discuss general issues of the ETL, ask questions and read the weekly updates that I will be posting here! DO NOT POST VOWS HERE - GO TO YOUR FORUM'S OUTPOST!!! Watching all the Outposts go up has made me a very happy man this morning and helped to counterbalance the fact I woke up about three hours earlier than intended. May your blends be smooth, your highlights crisp and your paint water undrunk! Just a quick question. Two of the squads I want to paint for the ETL have one member already painted (An intercessor and a Hellblaster) Would this be okay if I threw in three Rievers and not counted their points? More similar scale models but not a legal squad size now. Well, you can add a similar mini (unpainted) as a count-as or you can include the painted mini and receive a points penalty equals to the mini’s point value. I prefer the former if you have the option. Strange. Just said "The Bolter and Chainsword cant perform this action at the moment". Three Rievers is it then, as I intend on my first vow being all the Primaris guys I have. Currently I have one model (Kastellan Robot) painted from a squad of 6 I am planning on, One is undercoated with leadbelcher and reposed and 4 are still in boxes on sprues. Would I only be able to vow the unit of 5 kastellans for ETL? I'd be pledging Forces of the Imperium of course! Kastellan Robots come In units of between 2 and 4 Robots each. As such it’ll be fine if you vow a unit of 2 and a unit of 3 - so 5 in total. Does this answer your question? Let me know. Yes it does, would it matter if I post them altogether when done to avoid clutter, or post them as a 2 and a 3 with the required pictures (before and after)? and also, would I still be able to post them on my Plog? Edited by Omnissiahs Fury, 30 April 2018 - 10:56 AM. Of course you may take a single picture of everything and explain in your vow the configuration of the two units. And they can definitely be part of the same vow, and even have additional units in the vow. Actually there is no limit to the number of units contained in a vow - so go crazy. And most certainly you may post them in your blog or wherever else - your minis mate! This is actually the most common practice. Minor note: The Space Wolves Outpost Thread has a minor error in the title. But apart from that I am giddy and hella motivated for this. Thank you, Captain Semper! Now what happens when my forum's outpost is still locked? WOooooooo!!! For Chaos and Glory! ONWARDS CHAOTIC BRETHREN TO FOUR ETL WINS - ONE FOR EACH GOD!!! !